I shared the story of what I hope to be my first of many trips to Chicago’s Oak Woods Cemetery here. What fence? Notice the headstone/tree combo? This isn’t part of Oak Woods. 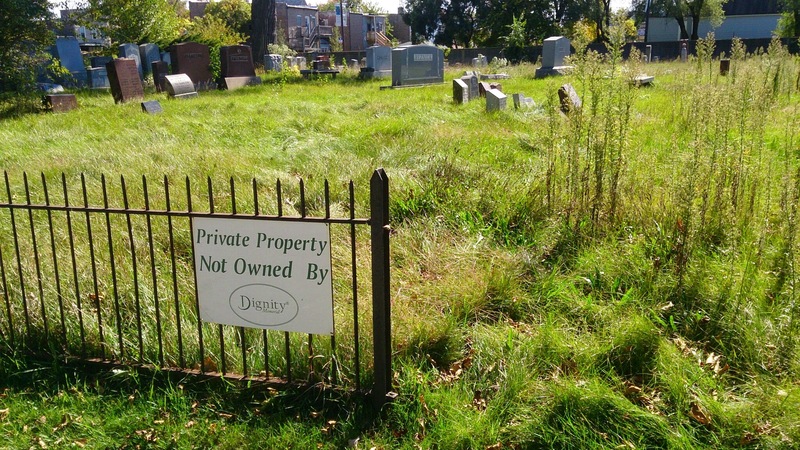 It’s a different cemetery. See the cement wall between the cemetery and the houses in the distance? What must the families of the deceased be feeling? What if these were your ancestors? Any ideas about how we might find those responsible? Sam, records must have been created when the burials took place. Where one might find them is the $64,000 question. If you review other comments on this post, you’ll find some clues to help begin the search for your relatives. 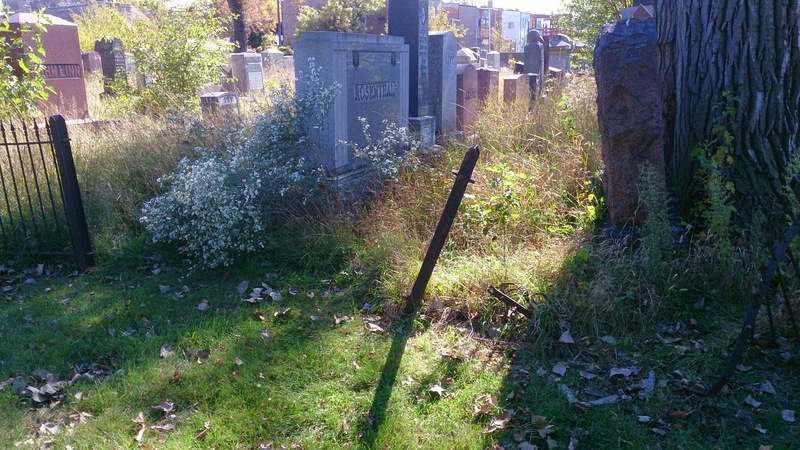 Good luck to you – please let us know if/when you locate the cemetery owners/managers. I’m glad you had the opportunity to see Jewish Oakwoods in person. 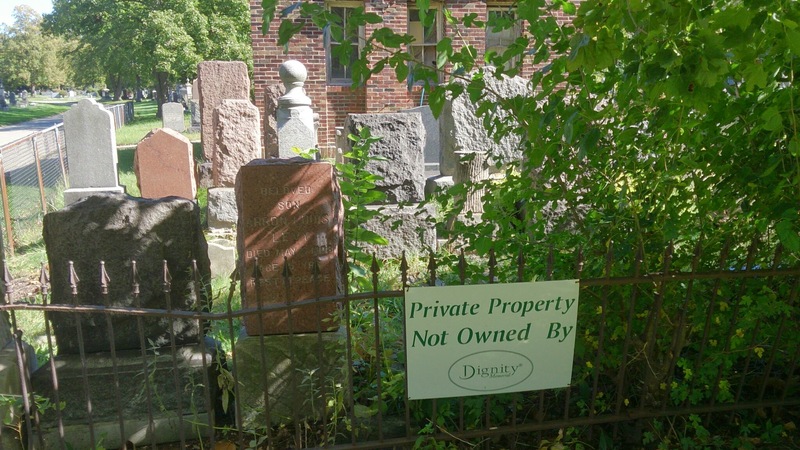 It troubles me that any cemetery is allowed to fall into such a state. What I found most disconcerting during my visit were the stones on the graves; signs that family or friends had recently visited. Imagine their horror at seeing a loved one’s final resting place in such a state! Thank you for sharing the interesting book and web site – I enjoyed exploring both. Helps to understand the story behind the cemetery, but still troubling. Did you find what you were looking for at Oakwoods? It troubled me that the congregation that established it does not care for it. Especially since most of the burials are older, and I am sure the people who visit are elderly themselves. I understand that they are no longer nearby, but they are not defunct either. I also find it bothersome that Oakwoods does not step up either. 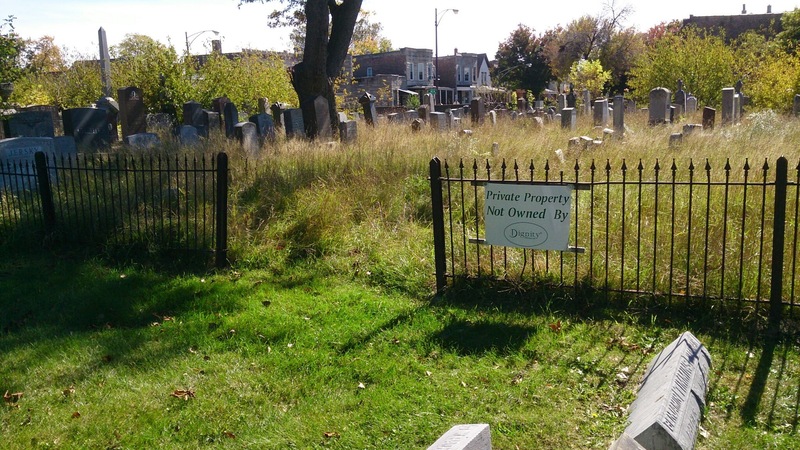 They pride themselves on being both a historic and beautiful cemetery. I realize it is not their responsibility to take one. However, they do not have to keep it up regularly; however, they could mow the grass several times a year. I am glad you enjoyed the information I found today. I am still in a bit of shock that congregation that chartered it is not taking care of it. I found both individuals I was looking for. Well, at least the area they were buried in. Both are in opposite corners of the cemetery in a Potter’s Field. It’s a frustrating situation all around. 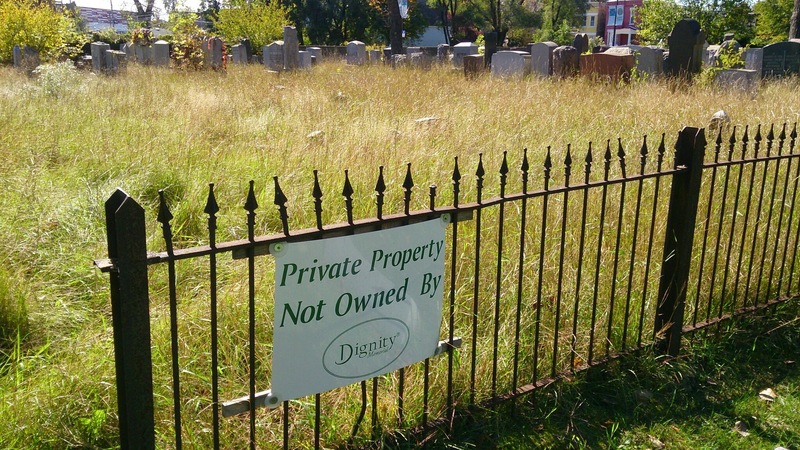 I understand Oakwoods’ reluctance to take on the liability issues of caring for this section of the cemetery – an area they don’t own. However, it’s hard to see how neglected the area is and not think as you do, just cut the grass once in awhile. My understanding is that when Oakwoods had the wall constructed around the cemetery, they included the Jewish cemetery as a courtesy. I’m sure the families appreciated the gesture; it would be nice if the congregation would repay the act by contributing to the care of the area. In my humble opinion, the congregation is ultimately responsible. 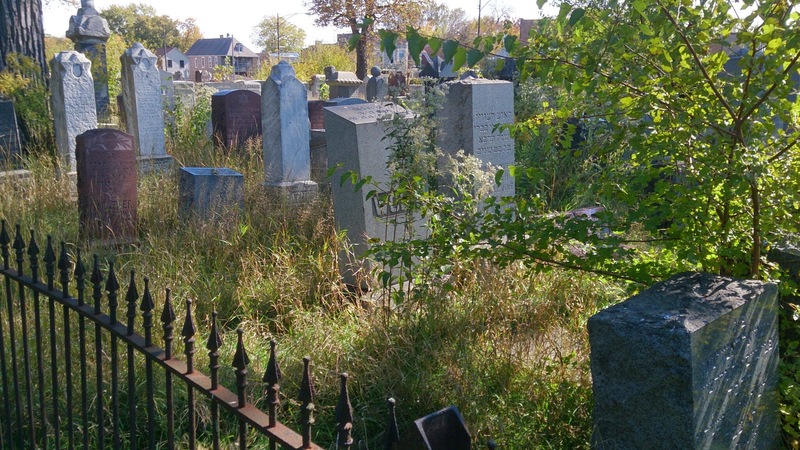 They should be ashamed of the deplorable condition of their members’ final resting place. 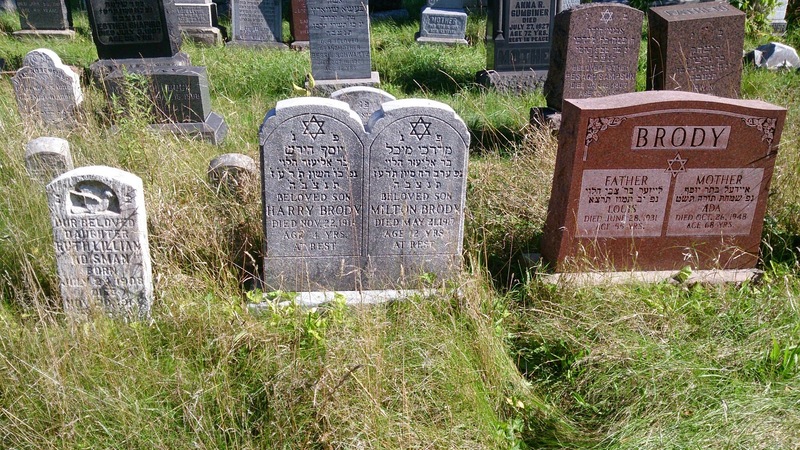 It’s so sad that the Jewish cemetery is in such bad shape. Some of the stones don’t look real old–and it seems like the children of some of the people buried there might still be living. I had the same impression. 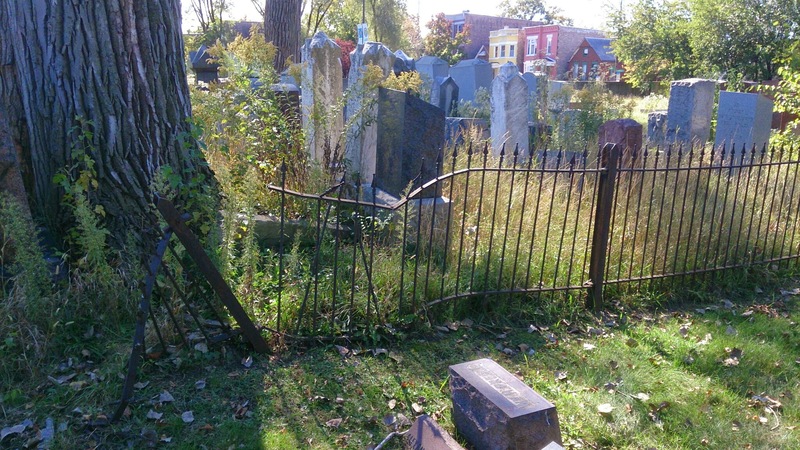 If my family was buried here, I’d be making a heckuva ruckus about the condition of the cemetery. It’s reprehensible.